The small print handwriting lessons are for children who have learned to write letters and now need to practice writing smaller. The letters are made small in the lessons. 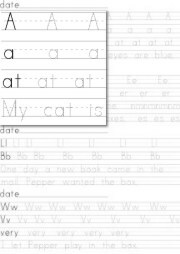 I used two different letter styles in the worksheets sets. Each worksheet contains either 2 or 4 short practice sessions/lessons. The lessons consist of tracing and sentence writing as well as writing letters or numbers on their own. While I have the Rules of Civility Booklet linked here, it is not actually a handwriting exercise. It is copy work. On the left hand side each spread, I have listed several rules from George Washington's Rules of Decent Behavior. On the right side of the 2-page spread is ruled paper where the student is supposed to copy some or all of the rules in his or her best handwriting. About Keys and One newly Alpha-Keyed single subject grader PDF file and one newly Alpha-Keyed XLS Grade book.